March is the month for highlighting the best players in college basketball. In Mobile Madness, we want you to relive the glory days by playing with these NBA players set at their prowess in college! 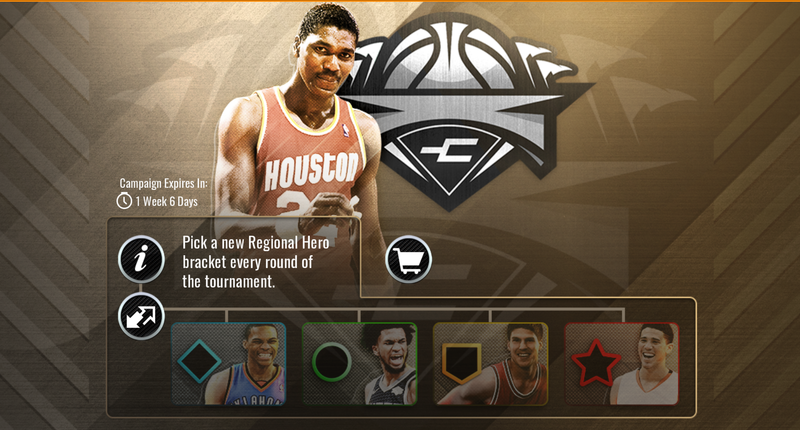 The goal is to earn Gold Bracket Tokens that turn into Elite Bracket Tokens that can be exchanged for upgrades to your Regional Hero or Elite Round Players (another option in Sets). 10 Gold Bracket Tokens equal 1 Elite Bracket Token. There are also Gameplay-style Bracket Tokens that you earn on a specific region map for that gameplay style. They can only be used on that Regional Hero. For instance, if you earn Balanced Bracket Tokens, you can only use them on the Regional Hero for Balanced. However, you can use the normal Elite Bracket Tokens on any hero in combination with Gameplay-style Bracket Tokens. There are two types of maps: (1) campaign main map and (2) four region maps emanating the four regions in the real life tournament. 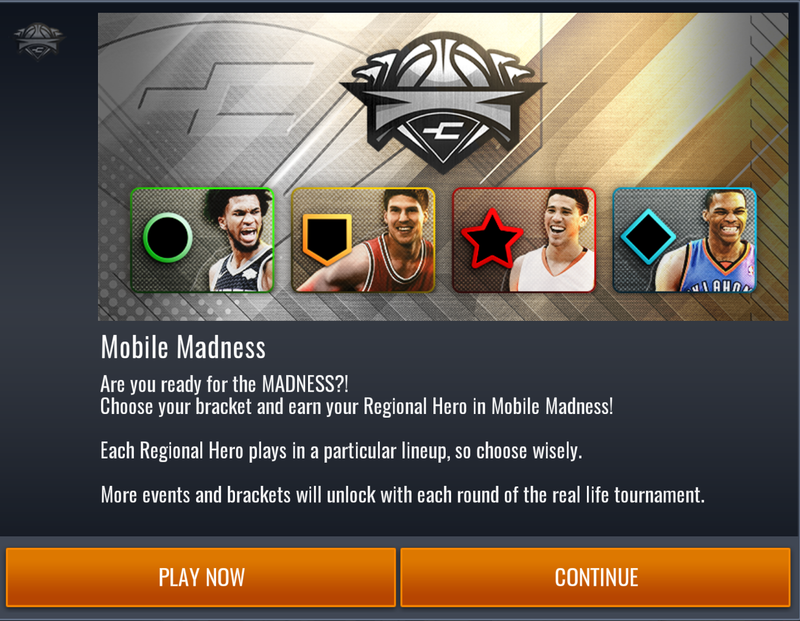 The campaign main map shows the Mobile Madness Master Hakeem Olajuwon that you can acquire (more on that later), info on the campaign, set link, store link, 3 blitz events, and 4 region maps. Each region map shows a set link to open up the map for progress, progression events in the format of a bracket, and the Regional Hero you can earn at the end of that bracket. When we say ?region,? we are referring to the gameplay style of Balanced, Defensive, Shooting or Street. 1) You will receive a notification of the campaign with a Regional Choice Token attached. 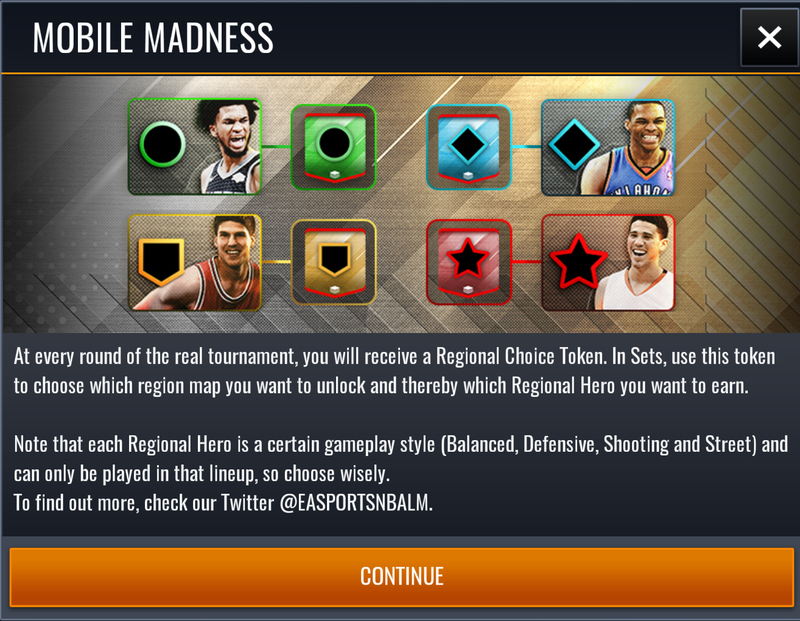 2) In Sets, you will use this Regional Choice Token to choose which region map you want to unlock. Note that whatever you choose here will mean you are working towards that Regional Hero, so choose based on which one you want to earn first. 3) On the region map you choose to unlock, you will see the first bracket of 4 progression nodes unlocked (Round of 32 events). They are comprised of 5v5 events that give bracket tokens on first win only. In each progression node, there are 4 events to complete. 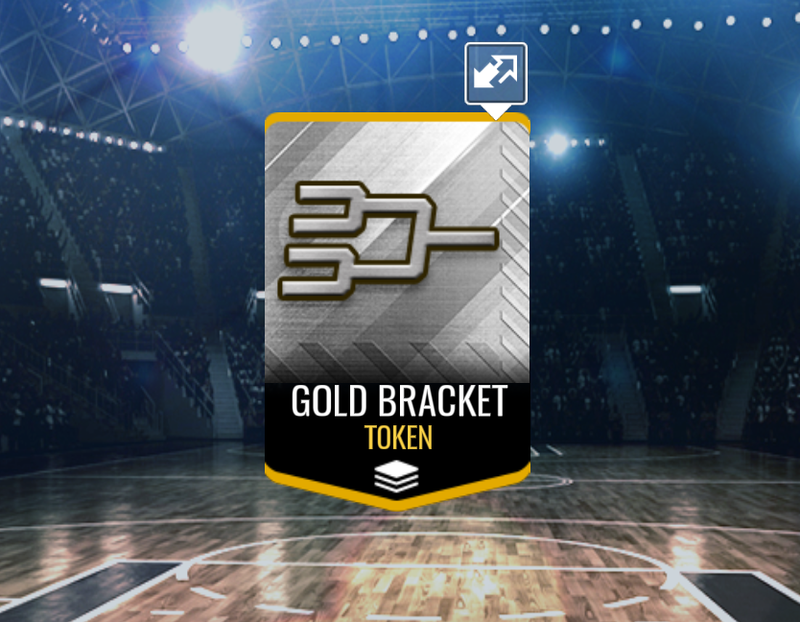 The first three give 1 Gold Bracket Token each and the final fourth event gives 1 Gameplay-style Bracket Token. Therefore, for this round of progression nodes, you get a total of 12 Gold Bracket Tokens and 4 Gameplay-style Bracket Tokens. That concludes the first set on the bracket, aligning with Rounds 64 and 32 of the real life tournament. 4) For Round of 16 on March 28, two things will happen: (1) The next round of progression nodes on the bracket will open up. These nodes will contain 2 events each that award 1 Gold Bracket Token and 1 Gameplay-style Bracket Token. 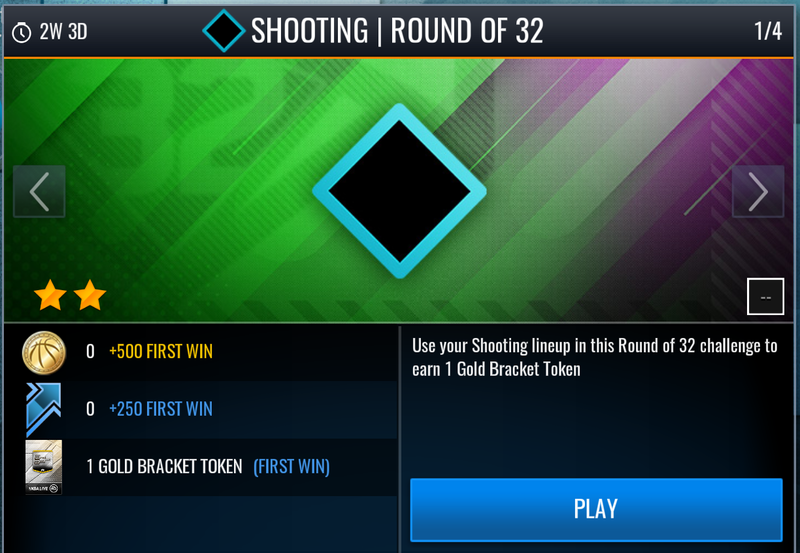 Since there are 2 nodes on this round, you will earn 2 Gold Bracket Tokens and 2 Gameplay-style Bracket Tokens total. (2) You will receive another Regional Choice Token so you can unlock another region to work on. The new region you choose to unlock will automatically have the first two rounds of progression nodes unlocked to match your first region. 5) For Round of 8 on March 30, two things will happen: (1) The next round containing one progression node on the bracket will open up. This node will have 2 events awarding a total of 1 Gold Bracket Token and 1 Gameplay-style Bracket Token. (2) You will receive another Regional Choice Token so you can unlock another region to work on. The new region you choose to unlock will automatically have the first three rounds of progression nodes unlocked to match your first region. 6) For Round of 4 on April 6, two things will happen: (1) The next round containing one progression node on the bracket will open up. This node will have 2 events awarding a total of 1 Gold Bracket Token and 1 Gameplay-style Bracket Token. (2) You will receive another Regional Choice Token so you can unlock the final region to work on. The final region will automatically have the all the rounds of progression nodes unlocked to match your first region. 7) There are 3 Blitz events that reset their first win bonus every 8 hours. 25 stamina blitz = 1 Gold Bracket Token on first win and 1 Gold Bracket Token on repeat wins. 50 stamina blitz = 2 Gold Bracket Tokens on first win and 2 Gold Bracket Tokens on repeat wins. 75 stamina blitz = 3 Gold Bracket Tokens on repeat wins (none on first win). 8) To accelerate progress: (1) Claim your bonus pack in the Store every 4 hours to get 2 Gold Bracket Tokens. (2) Purchase Coin Pack in the Store to get 5 Gold Bracket Tokens. 11. At the 93, 95, 98 and 101 OVR upgrade sets on each Regional Hero, you will also receive a fellow alumni of that Regional Hero. So if you upgrade Russell Westbrook to 101 OVR, you will have also received a total of 4 of his alumni from UCLA. The idea is that by this point you now have an entire lineup of the best from that college. 12. Elite Round Players: These are exclusive players at their best in the NCAA. The stats are completely based on what they were in college. Exchange 5 Elite/Balanced/Defensive/Shooting/Street Bracket Tokens for a pack containing a 90+ OVR Elite Round Player (5% chance at 99 OVR player). 13) Ability Token: Exchange 10 Elite Round Players to get an Ability Token. You will only be allowed to claim 1 Ability Token that you can then use on any one of the 101 OVR + boost Regional Heroes or the Mobile Madness Master 102 OVR Platinum Hakeem Olajuwon. 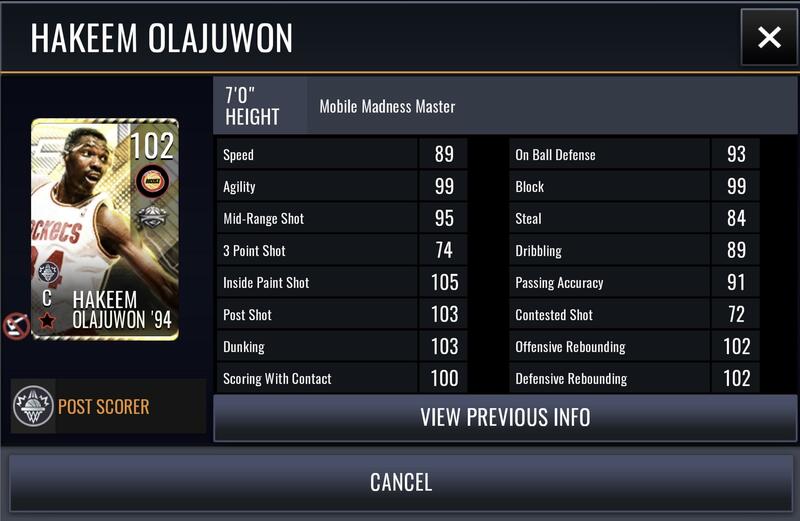 14) 102 OVR Platinum Mobile Madness Master Hakeem Olajuwon: Once you reach 101 OVR with a Regional Hero and complete that set (just the OVR, not the 101 with boost), you will receive a Region Mastery Token. Exchange 4 Region Mastery Tokens and 20 Elite Round Players to receive the 102 OVR Platinum Mobile Madness Master Hakeem Olajuwon. Once you get him, you will get to choose which gameplay style you want him to have. His ability is In The Paint if you choose to use the Ability Token on him. Olajuwon spent three years in college and was a stalwart at the Center position, posting an average of 13.3 points and 10.7 rebounds. He also took his team to the tournament finals twice and despite coming up short, he was named the Most Outstanding Player in the tournament in 1983. ?The Dream? continued his legacy in the NBA as a member of the Rockets, where he would go on to win an NBA title in 1994. We chose these Regional Heroes based on the best from the teams currently in the real life NCAA tournament this month. The ?region? pertains to their gameplay style. A consensus All-American in his lone college season, Bagley III was also named his conference?s player of the year. The rookie power forward converted his strong college career into the 2nd overall pick in this past year?s NBA Draft and hasn?t looked back since. Since returning from injury in early January, Bagley III has managed a healthy 15.5 points and 8.3 rebounds for the Kings. McDermott was a three-time All-American, Conference Player of the Year and a Naismith Award winner in his illustrious college career. Shooting a red-hot 45.8 percent from beyond the arc throughout his college years, McDermott became the 5th all-time leading scorer in college history. Over the course of his five seasons in the NBA, ?McBuckets? has shot 40.5 percent from distance and just over 45 percent from the field as a whole. Despite a quiet season as a freshman in college, Westbrook exploded in his sophomore year and began to show flashes of the player that we know today. Westbrook played his way to the 4th overall pick in the 2008 NBA Draft and his meteoric rise only continued from there. The OKC Point Guard has collected accolades ever since; becoming NBA MVP in 2017 and is averaging a triple-double for his third consecutive season. Booker led his team to the round of four in his lone season in the tournament, with the help of fellow alumni Karl-Anthony Towns. Booker?s knack for shooting three-pointers and his ability to create his own shot in college made him a lottery pick in the 2015 NBA Draft. This season, Booker is averaging career-high numbers in both points and assists per game and is viewed as one of the young stars of the NBA. 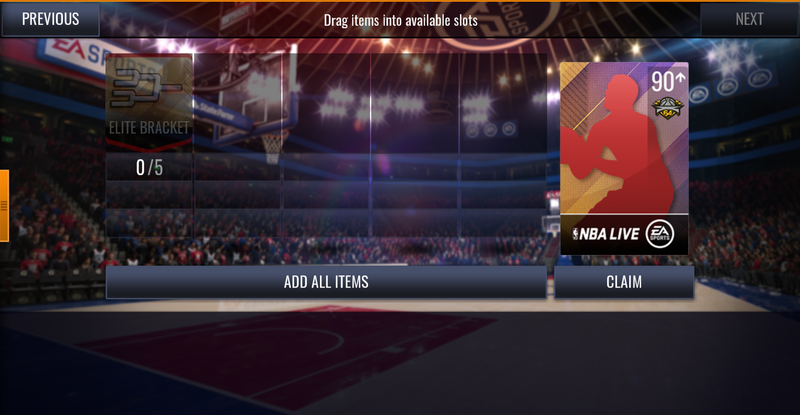 In the Elite Round Player packs you acquire through exchanging 5 bracket tokens in Sets, you get a 5% chance each time at a 99 OVR Elite Round Player below. Each one unlocks at a certain round from the real life tournament. Channing Frye spent all four years in college and was named to the All-Region team in 2005, largely due to his efforts in the Round of 64 that year. Frye would go on to become the 8th overall pick in the 2005 draft and was named to the All-Rookie team with the Knicks after averaging 12.3 points and 5.8 boards. Round of 32: 99 OVR ??? Round of 16: 99 OVR ??? 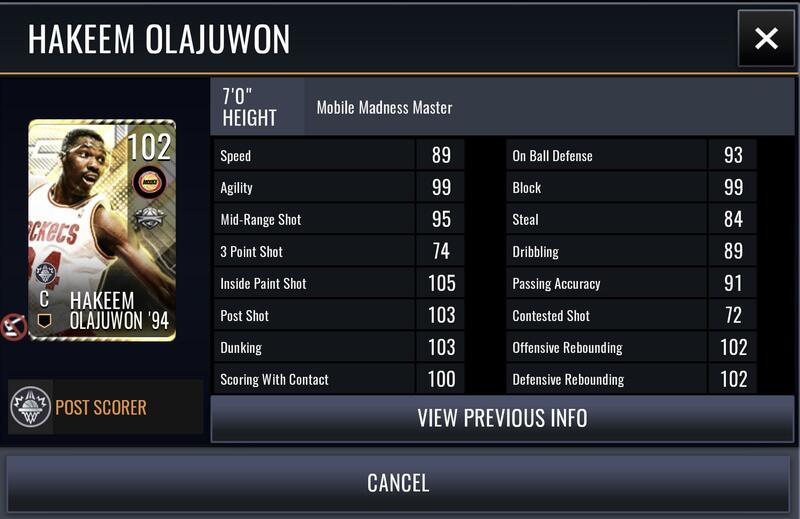 Round of 8: 99 OVR ??? Round of 4: 99 OVR ??? Once the campaign is over, all versions of the Regional Heroes become auctionable. 1) Repeat bonuses on blitz events are just as important if not more than first win, rewarding those willing to keep playing them. 2) You get to freely choose which Master (Regional Hero) you play for. 3) Gameplay-style Bracket Tokens and Elite Bracket Tokens are both acceptable in completing the Elite Round Player set. You may also use the Elite Bracket Tokens to upgrade any Master (Regional Hero). This makes the collectibles you earn throughout the campaign highly useful and versatile. 4) We have added many more new, unique players especially with the addition of the Elite Round Players. Lol true but I actually like this balance better between p2p & f2p. If you want all the masters you gotta pay but you still get a master depending on how much you grind. The cards look pretty fire I wonder if you can make multiple ability players. The content didn't load (no surprise) so hopefully soon we can find out. I agree with how they're better with giving you at least a master for free and then getting more costs money. The only complaint is like the allstar promo was crazy expensive to get Durant. LOL...I had 997! Figure I lost about 180 waiting for it to start since I missed the 10am EST start time (assuming it was published somewhere)?! Hang on, just so I understand here - it looks like you can't use the regional masters in any other lineup except for their regional specific ones? So if I go after McDermott - I'll only ever be able to use him with my defensive lineup? Can't really see the logic in that. I tried to put the base version in my NBA Lineup, or Showdown-specific lineup, and I wasn't able to, so I guess they really are limited to those specific lineups. Pfffffffff, big thumbs down! Edit - OK, I'm dumb. I thought that McDermott was a SG, but they put him at SF. It's a shame, since I'm set at SF and could use an upgrade for my bench at SG. I guess I get what I deserve for not looking closely enough at the positions. Is there a clear favorite to choose based on all "available" players to date (eg another 101'ish SF seems redundant except when you consider clutch and 3pt boost)? Are most going for Westbrook based on his cards usual play (ie better than his stats)? I went for McDermott 1st. His stats + clutch + boost are too good to pass up. I'll go for Westbrook 2nd. We should be able to grind 2 boosted players for free. Is there any other use of the elite (lineup specific) brackets other than to be used in their respective sets? Is there any other use of the elite lineup backups.. eg elite shooting brackets.. are they only for the westbrook sets? You can use them on your main nba lineup as well. As a Westbrook groupie I wanted him so bad but I pick players based on the ovr needs of my team and not who has the best stats or gameplay or who I like. 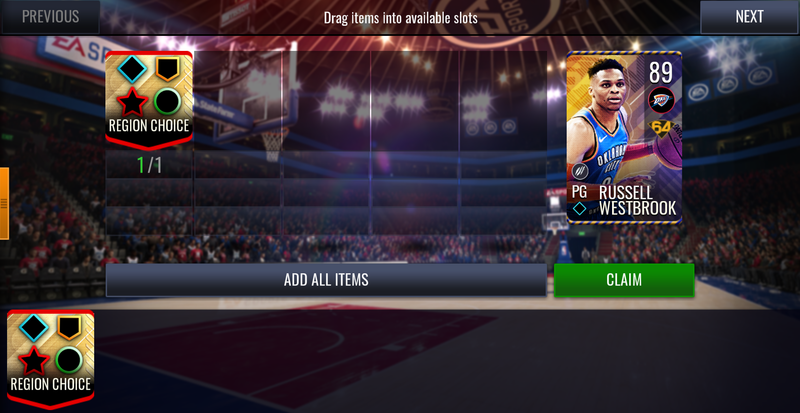 Currently the lowest ovr player I have is my bench SG so I chose Booker. But man I want that Westbrook, I'll probably wait for a higher ovr Westbrook for my legacy team. So everyone completing the sets for masters and not go money making like exchanging for elites then sell? Though looks like that the elite exchange is limited to 5 times only. Long read. Unintentionally did that lol.